Panel Confirmed for Ballroom 20 on Thursday, July 24 from 3:30-4:30 p.m.
New York, NY (July 8, 2014)-- MTV announced today the "Teen Wolf" panel at San Diego Comic-Con will take place on Thursday, July 24 from 3:30 to 4:30 p.m. in Ballroom 20. Tyler Posey, Dylan O’Brien, Tyler Hoechlin, Holland Roden, plus new cast members Shelley Hennig and Dylan Sprayberry, along with Executive Producer Jeff Davis, will once again take Comic-Con by storm, giving fans a can’t-miss panel in which they will share season four secrets, debut a new mid-season trailer and answer fan questions. The panel will be moderated by Buzzfeed Senior Editor, Jarett Wieselman. "Teen Wolf” will also have a show-themed booth on the convention center floor for the first time ever. The booth (#3729) will be open to fans all weekend long and will be highlighted by signings and special appearances by cast and crew. The booth will also feature four full days of activations where fans can insert themselves into a custom character poster and create their own “Teen Wolf”-inspired monster. Additionally, MTV commissioned artist Swann Smith to illustrate a limited edition bestiary that serves as a full guide to the creatures of Beacon Hills. The bestiary will be distributed for free throughout the weekend and Swann will be on hand signing copies at the booth. There will also be a cast signing at the Twentieth Century Fox Home Entertainment booth (#4213), which distributes the DVD. Special edition season three DVDs that will be exclusive to Comic-Con attendees, will also be available for purchase at the Twentieth Century Fox Home Entertainment booth. For more ways to connect with “Teen Wolf” like it on Facebook at Facebook.com/teenwolf or follow the show on Twitter @MTVTeenWolf and #TeenWolfSDCC. Visit MTVPress.com for photos and more information. *Must RSVP and receive confirmation from MTV to attend. Exact room location will be release upon confirmation. “Teen Wolf" was developed by Jeff Davis (creator, "Criminal Minds") who also serves as executive producer. Additional executive producers include Russell Mulcahy ("Highlander," "Resident Evil: Extinction"), Marty Adelstein ("Prison Break"), René Echevarria ("Medium," "Castle"), Tony DiSanto and Liz Gateley. The pilot was written by Jeff Davis and Jeph Loeb & Matthew Weisman and directed by Russell Mulcahy. The "Teen Wolf" series is based on a Screenplay by Jeph Loeb & Matthew Weisman. Julie Schwachenwald, Dana Gotlieb-Carter and Alexandra James are the MTV executives in charge of production. The series is a co-production with, and distributed by, MGM, in association with Lost Marbles Productions, Inc., First Cause, Inc. and DiGa. MTV is the world’s premier youth entertainment brand. With a global reach of more than a half-billion households, MTV is the cultural home of the millennial generation, music fans and artists, and a pioneer in creating innovative programming for young people. MTV reflects and creates pop culture with its Emmy®, Grammy® and Peabody® award-winning content built around compelling storytelling, music discovery and activism across TV, online and mobile. MTV’s sibling networks MTV2 and mtvU each deliver unparalleled customized content for young males, music fans and college students, and its online hub MTV.com is a leading destination for music, news and pop culture. MTV is a unit of Viacom Inc. (NASDAQ: VIA, VIAB), one of the world’s leading creators of programming and content across all media platforms. For more information, go to www.mtvpress.com. MGM Television is a leading producer and global distributor of content for television and digital platforms, with distribution rights to original productions and a robust catalog of 10,500 television episodes and nearly 4,000 feature film titles covering some of entertainment's premiere franchises including the James Bond franchise and “The Hobbit” trilogy. Current television projects include the hit series “Vikings,” heading into production for its third season on HISTORY; the critically-acclaimed limited series “Fargo,” a co-production with FX Productions and “Teen Wolf,” which will air its fourth season on MTV. In addition, MGM Television serves as the syndicator for "Right This Minute" and “Let’s Ask America.” Through its finance and distribution entity,Orion TV Productions, MGM Television’s courtroom series "Paternity Court" with Lauren Lake begins production this summer. For more information, visitwww.mgm.com. New York, NY (June 26, 2014)--MTV announced today that its hit drama series "Teen Wolf" will return to San Diego Comic-Con for the fifth year in a row with a panel featuring series’ stars on Thursday, July 24. 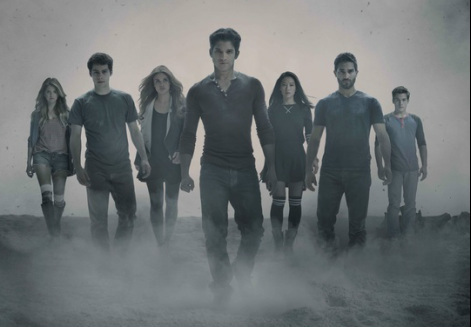 “Teen Wolf” will also have a show-themed booth on the convention center floor for the first time ever. The “Teen Wolf” booth (#3729) will be open to fans all weekend long and will be highlighted by signings and special appearances by cast and crew. The booth will also feature four full days of activations where fans can insert themselves into a custom character poster and create their own “Teen Wolf”-inspired monster. Additionally, MTV commissioned artist Swann Smith to illustrate a limited edition bestiary that serves as a full guide to the creatures of Beacon Hills. The bestiary will be distributed for free throughout the weekend and Swann will be on hand signing copies at the booth. On Friday, July 25 MTV will host “Teen Wolf” press room and also hold a signing with cast members at the Twentieth Century Fox Home Entertainment booth (#4213), which distributes the DVD. Special edition season three DVDs that will be exclusive to Comic-Con attendees, will also be available for purchase at the Twentieth Century Fox Home Entertainment booth. For more ways to connect with “Teen Wolf” like it on Facebook at Facebook.com/teenwolf or follow the show on Twitter @MTVTeenWolf.